Ductility Molds and Base Plates - Gilson Co.
Ductility Molds and Base Plates are for use with Temperature-Controlled Ductility Testers when testing binder specimens, and meet several ASTM/AASHTO standards. Molds and plates are each needed for testing, and each product is sold separately. Up to three mold/plate sets can be used simultaneously in the ductility tester. Molds are constructed of precision-machined brass, while the base plates are made of aluminum or brass. Having additional molds available allows for more efficient sample preparation and high-volume testing. LPA-20 Standard Ductility Mold is made of brass. It consists of two side pieces and two end clips with mounting holes and meets ASTM D113. LPA-21 Force Ductility Mold is also brass and has similar components as LPA-20, but meets AASHTO T 300, AASHTO T 301 and ASTM D6084 requirements. LPA-24 Standard Ductility Base Plate is aluminum and used to form the base for one LPA-20 or LPA-21 mold. Plate dimensions are 5.5x2x0.1in (140x51x3mm). 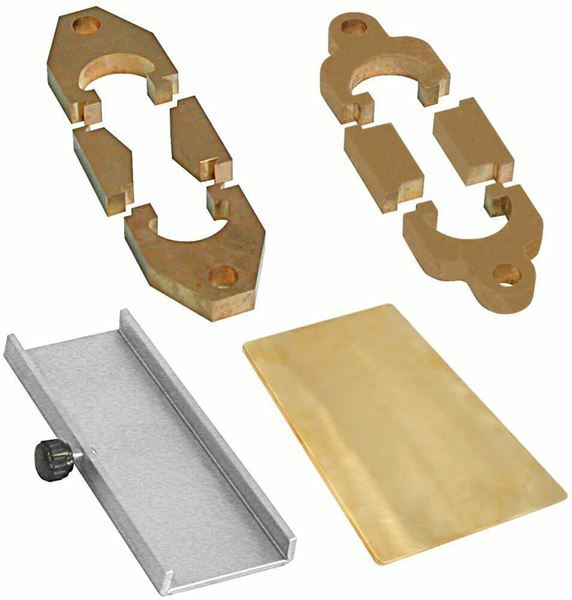 LPA-26 Large Ductility Base Plate is made of brass. It is 5x8x0.1in (127x203x3mm) in size, and can accommodate three Standard or Force Molds at the same time.